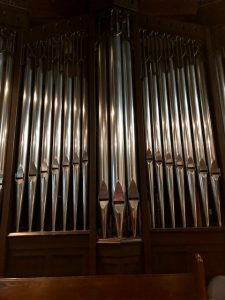 The first pipe organ in the present St. Thomas’ Church building was a three-manual Austin, one of a number of instruments donated to churches by the Curtis family in the 1930’s. By the 1970’s, during the rectorship of the late J. F. Titus Oates, this organ had fallen into disrepair and the decision was made to replace it with a (then) state-of-the-art three-manual Rodgers electronic. Unfortunately, electronic organ technology moved very fast and very far over the next years. The Rodgers was essentially a one-off style of instrument, built immediately before the advent of digital electronics. When it ultimately needed maintenance and repair work it was found that the proper parts were unavailable, and that the builder even lacked a shop manual. It did, however, hold together and remain playable until one fateful day when incumbent organist Jerry Koontz was preparing to accompany a Brahms concert to be conducted by the current minister of music at St. Thomas’. The organ breathed its last while Jerry was checking his registrations, and the entire affair was at the last minute moved to the Congregational Church. This untoward event having stirred considerable interest, the decision was then made to form an organ committee and to engage John Doney as professional consultant. The committee heard and inspected numerous representative instruments from several builders, and ultimately agreed with John Doney’s advice to contract with the Schantz company, a family-owned Ohio business of long standing and high reputation. Many individuals, families, and foundations contributed memorial donations to the major fund-raising effort that was required, and the present instrument was installed and voiced under the personal direction of Burton Tidwell, the tonal director of Schantz, in the late winter and spring of 1992. The dedicatory recital was given later in the year by Dr. John Weaver of the Curtis Institute. There are standard intramanual and intermanual suboctave, superoctave and unison couplers. An additional set of couplers together with the ‘unison offs’ allows the transfer of the Great to Manual I and the Choir to either Manual II or III. There are ten general combination pistons (duplicated by toe studs), and six divisional pistons for each division. The Swell and Choir divisions are under expression. Accessories include a crescendo pedal, a sforzando piston and toe stud, and a reversible piston for the prepared-for Zimbelstern. Thanks to a gift, we have been able to upgrade the combination action and there are now thirty-two levels of memory.